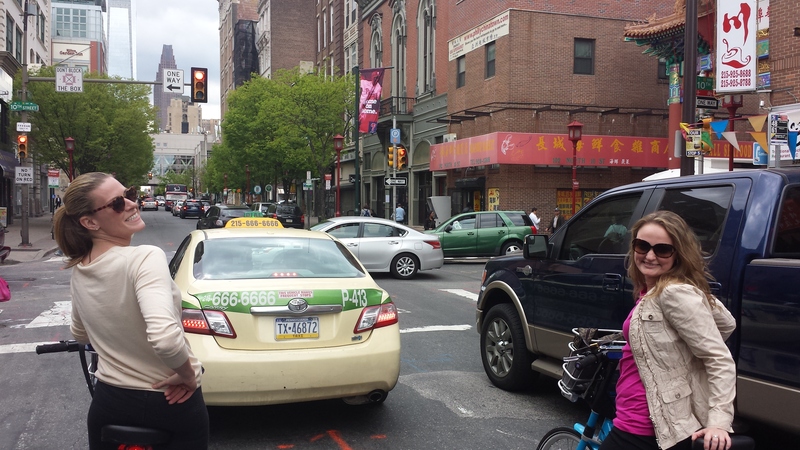 Last year, I spent the first weekend of May in Philadelphia with Philly Bike Tours, learning that I actually don’t hate bike riding as much as I thought. I then spent a glorious Saturday day drinking at Philly beer gardens, and attending the annual South Street Maifest, presented by Brauhaus Schmitz, which was the inspiration for this post about oktoberfesting year round in the city of brotherly love. 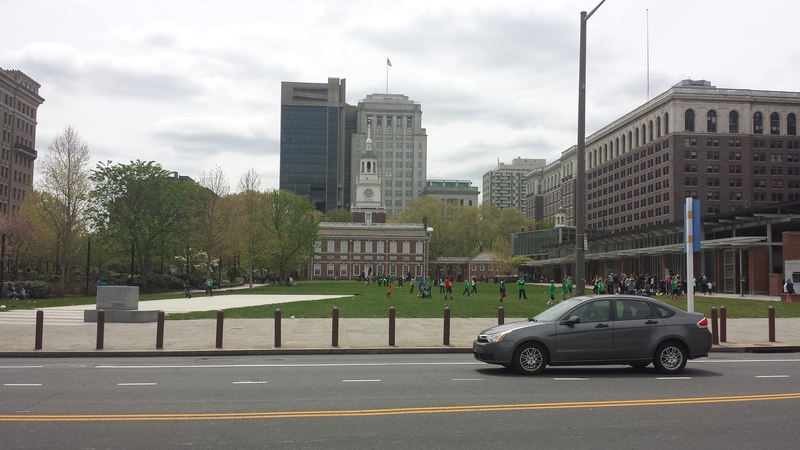 Because I’m not anything if not predictable, and because I’m a creature of habit, I once again ended up in Philadelphia the first weekend of May. And, once again, there was biking, beer gardens, a brief cameo at Maifest, and German Beer Halls included, albeit mostly in new locations. I had the day off Friday, so arrived in Philadelphia early that morning. Too early, it turns out, as I got to my sister’s place just in time for her morning run and was coerced into joining her. I don’t mind running per say, and am perfectly capable of doing three to five miles without embarrassing myself, but I was a little nervous about running out of steam too early, as our goal that day was checking out Philadelphia’s brand new bike share, Ride Indigo, to help me start checking off spots on Philadelphia’s own ale trail. The bike share station at 13th and Pine. 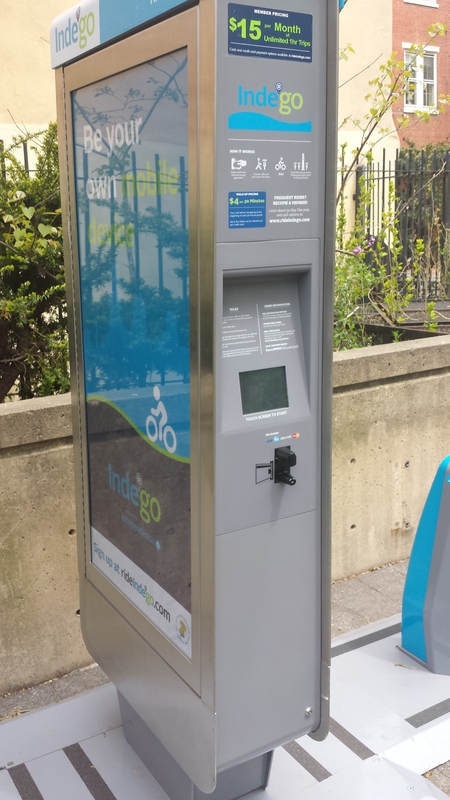 Ride Indego was just launched this past April 23rd. Philly’s long been considered one of the more bike friendly cities in the country, which makes sense: for the most part it’s perfectly flat, which makes for nice easy riding, and generally, once you’re off the highway, people don’t drive like assholes (76 is a completely different story). 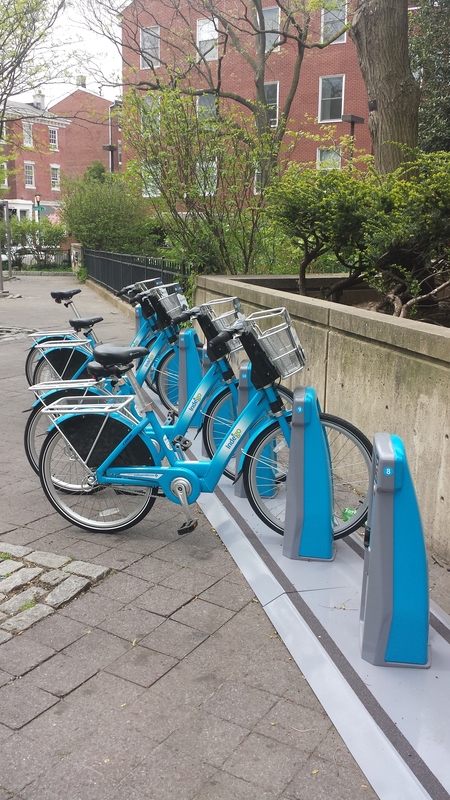 The bike share currently has over 70 bike share stations spread out around the downtown area, that you could rent a bike from, simply by having a credit or debit card. I think utilizing the bike share would be a great way for visitors to explore the city. It’s reasonably priced, you could design your own itinerary, and another nice thing is that unlike say, renting bike, you could dock (and thus not pay) for the bike when you’re not using it, and you don’t have to return it to the station you started at (with rentals I feel like there’s always a bit of “will we make it back in time”). If you don’t have a membership, rides cost $4.00 a half hour. You could purchase a monthly $15.00 membership, which makes any ride under an hour free, or do what we did, which was purchase a $10.00 yearly membership which clocks in hour rides for $4.00 (I’m in Philly enough that I’m confident I’ll get my money’s worth). The stations are open 7 days a week, 24 hours a day. A few tips after trying this out: A) invest and bring your own bike lock if you plan on barhopping like we did-you’re not always guaranteed a station close to where you’re going (we just happened to luck out) B) check out this interactive map of stations before you plan your itinerary-the bikes don’t come with maps so make sure you’re familiar with the city before you set out-I admittedly would’ve had a harder time if my sister wasn’t doing the navigating. 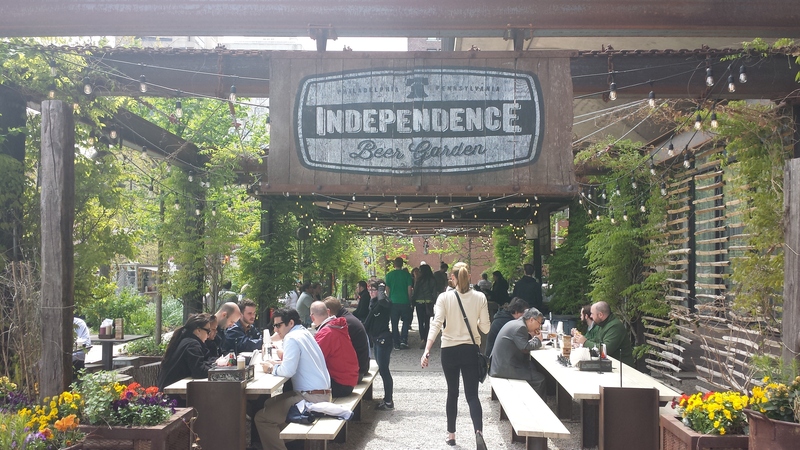 We started off our trip at the station closet to her apartment on 13th and Pine, and made the trek to Independence Mall to have lunch at the Independence Beer Garden. 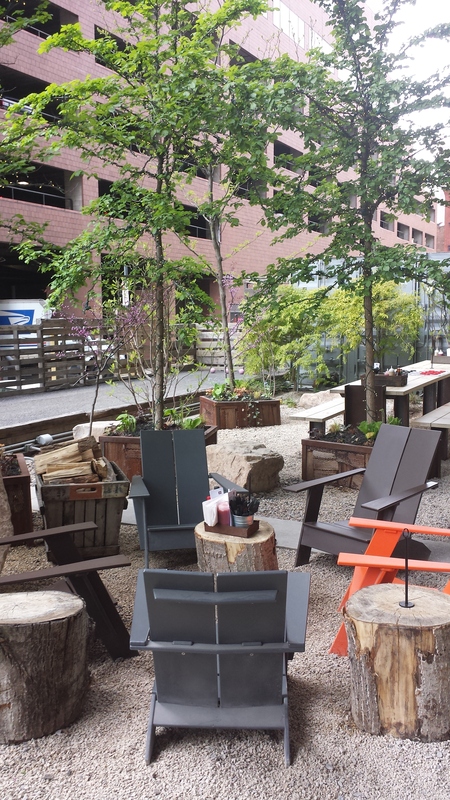 This pop-up beer garden, in it’s second year of existence, is a great summer time respite in the midst of Philly’s most historic district. 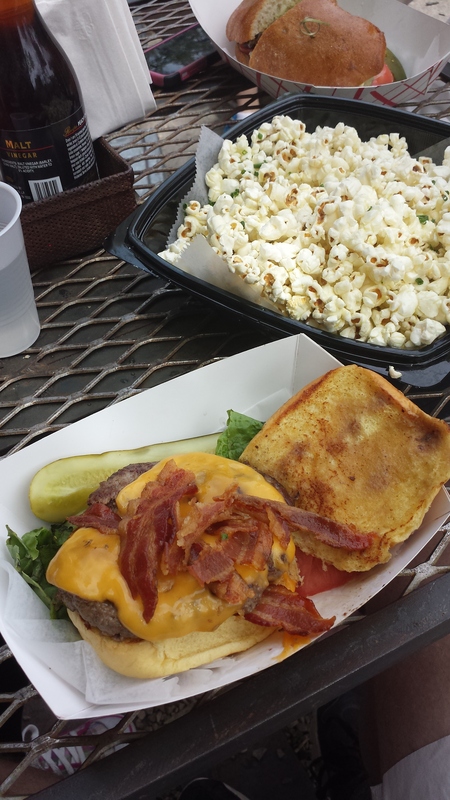 Here, we grabbed lunch, and a couple of brews (I was excited to find Lancaster Brewing Company Milk Stout). It was relatively quiet being a weekday, but from what I hear this place gets packed on weekends. 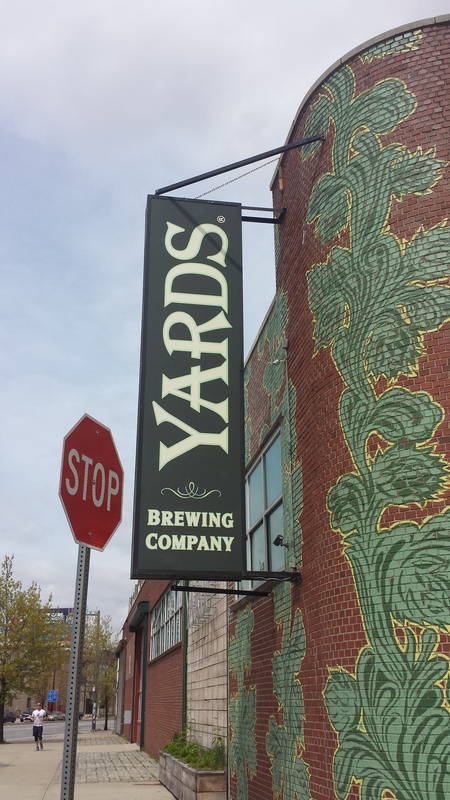 Our initial plans were to try Dock Street Brewing Company in West Philadelphia, which I’ve never been to, and then Yard’s, which I’d been to previously, but my sister had never visited. We were going to go to Dock Street first, as it’s a longer ride, but after checking out mapquest, realized it’d be over 50 blocks. Since none of us had biked in a while, we weren’t sure if that’d be overextending it, so opted for the closer, and more familiar ride to Yards. 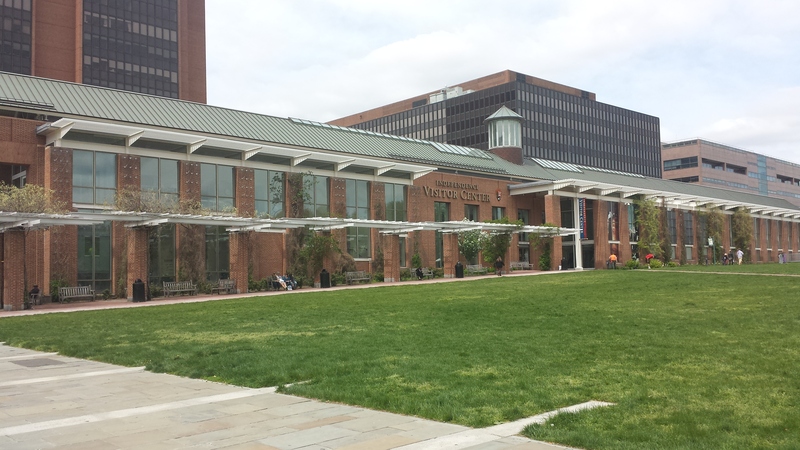 One of the bike stations was right outside the Constitution Center. It turns out that we would’ve been fine, as the ride to Yards took us less then 10 minutes. We parked our bikes at the nearest station, and walked the remaining three blocks to the brewery-it’s a great place to bike, right on the river and underneath the shadow of the Ben Franklin Bridge-which brings me to another cool point about biking the city: even if you are familiar with it, seeing it via bike is seeing it via a different angle. We got two samplers at Yards, and a pint each (I was excited to find an Icelandic style beer) and played some afternoon shuffleboard-I like Yards because unlike some breweries where you could just taste, the shuffleboard and a pool table make it a nice spot to hang out for a while. 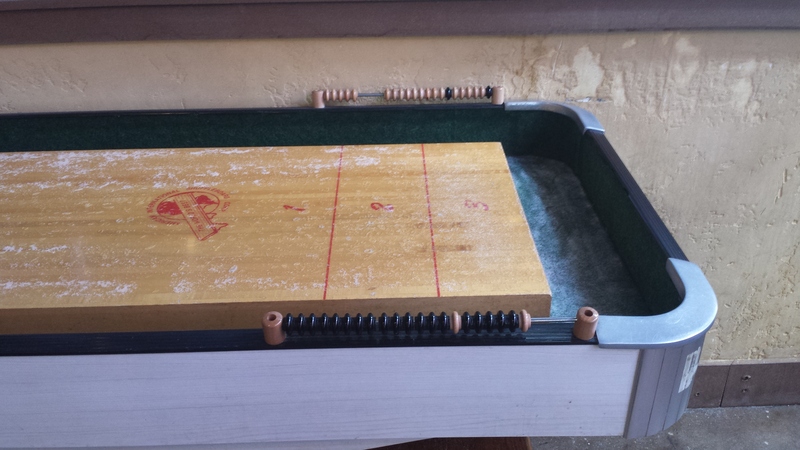 I’m just posting this to show off my shuffleboard score-I played solo against the two girls and got a 21-they got a 4. After staying for a bit longer than intended, we rode back into center city for some afternoon appetizers at Irish Pub. At this point, it was merging into Friday night rush hour, so we decided to ditch the bikes and just walk back to my sister’s apartment to get ready for dinner. That night, in keeping with last year’s theme,we visited Frankford Hall, an aforementioned German beer hall in Philly’s Fishtown neighborhood, that I’d never been to before, and that we cursed ourselves for not having ridden to earlier, as it would’ve been the perfect place to spend the afternoon. I also cursed myself the next morning for not having the ability to drink like a civil human and thinking that downing approximately 4 liters of German beer, after spending the day essentially barhopping, was going to be a good idea. Moderation is key kids. 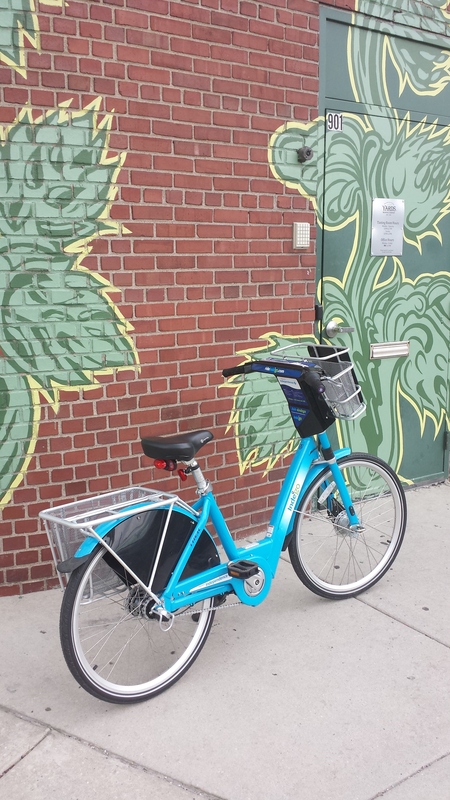 I was super excited to try the bike share, and left super excited to utilize it in the future. It’s a great way to see the city, and really convenient to use. In fact, we’ve already got an itinerary for next time I go down: eat lunch at Percy Street BBQ (we stopped there for drinks Saturday night, and its menu piqued my interests) and then take the ride over the Dock Street-maybe if we’re really ambitious head over to one of the other breweries that’s within the confines of downtown (St. Benjamin’s or Philadelphia Brewing Company)-we definitely have it in us, as long as I’m not anywhere that serves beer in 1-liter steins the night before.